Today is a special day; it’s our first Spotlight feature as Canadian Film Lab rather than UK Film Lab. If you’ve not seen our Spotlight features before, these are how we exhibit the amazing work that comes through our lab, and for each Spotlight we pick a photographer whose work has caught our eye and exhibit a range of their photography alongside a Q&A. So, on to our latest Spotlight, on Nils Karlson. Nils has been a long time client of ours, and much like our other clients we have grown to know each other personally and professionally and it really is like working with a friend. Working with Nils is a joy – we have seen his style grow and evolve into something truly unique, and it’s inspiring to see a photographer searching their soul, constantly pushing personal and technical boundaries to develop a style that communicates from within. Those who know Nils will know that among other things, he has a deep love for 2 things in particular – his 2 dogs (Romeo and Rudiger), and the sea. In fact, out of the many thousands of frames we’ve worked on for Nils, I cannot think that we have seen a photo from him that isn’t either of the sea or his 2 canine soul mates. Such is the talent of this photographer that despite what may seem to some as a narrow subject matter, his work is always engaging. After 2 years of preparation Nils has just launched a crowdfunding campaign for his first photobook, Earth Stands Still. The following interview will tell you more about his book, his work in general, and of course with photos to accompany it. To contribute to his crowdfunding campaign and receive a copy of your very own, head to his crowdfunding page – after just 48 hours it has already reached its target, but there is still the opportunity to contribute and receive your very own book. Q: Your book, ‘Earth Stands Still’ will be published soon. Could you tell us more about the project, and the inspiration behind it? The story of the book is based on the concept of Bardo, as described in The Tibetan Book of the Dead. Bardo can be translated as ‘intermediate state’, originally describing the state of existence between two earthly lives – the state after physical death and rebirth, a state of transcendence. I came to my personal conclusion that all is Bardo – we are always in betweens and transcendence, and it has emerged to a concept of existence without beginning or end. This picture soon became associated with my love for the vastness of the ocean, and I started wondering about the meaning of the horizon. 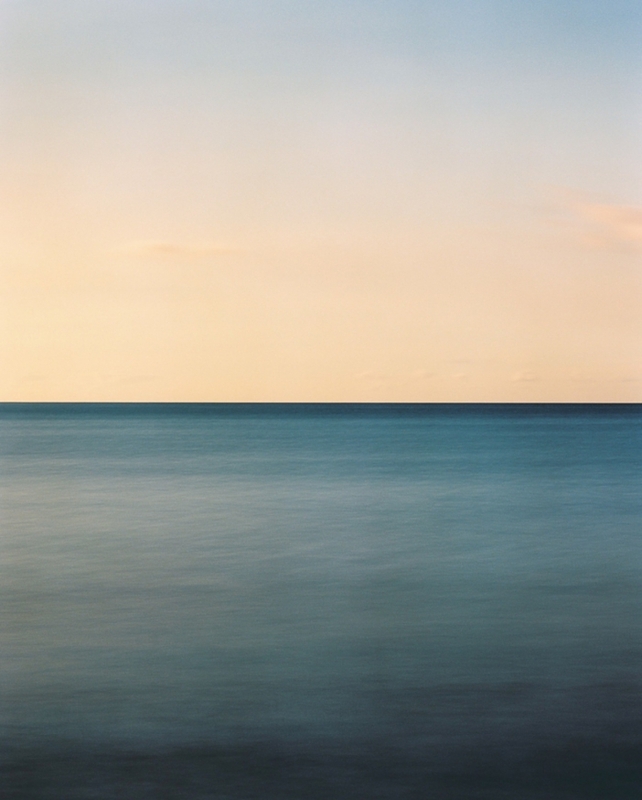 In many cultures, the horizon used to mark the end of the (known) world – a natural, often supernatural border. But apparently, the horizon is in constant motion, and no matter how far we sail, we can never reach an end. So what if there is no border, no abyss, no end? When there only is transcendence? How can I blur the vision of the horizon, and recreate a personal perception? This is where this book derives from. The only way to tell such a story photographically, seems to be a book. It provides enough room to build a structure, create an organic flow. This is where the hard part starts…choosing and editing photos, looking for a cohesive flow and building a narrative with a dramaturgy…it is like a musician working on an album. Q: In many cases your photographs are reminiscent of abstract paintings…did this style evolve, or did you set out with a complete and clear vision of what you wanted to achieve? It started out with a rather pictorial approach, trying to record the scene as it appeared in front of my eyes. But I have never found a true connection to my subject by this. This changed when I stumbled over an excellent book – „Liquid Light“ by Fabien Baron – at the photobook exhibition in Cologne 2014. 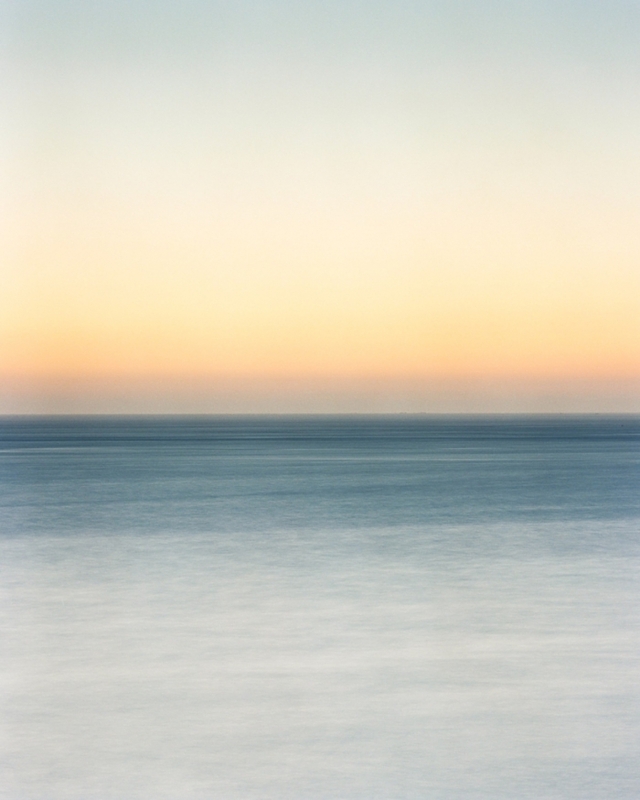 It featured the most minimal and quiet photos of the seascape I have ever seen: All long exposure images, featuring the horizon dead centre in a vertical frame. This became my starting point, and several concepts evolved from here. People often assume a Sugimoto influence, but that’s not the case. Q: The images in the book are beautifully compelling in their simplicity and yet technically they must not be easy to create….tell us a little bit about the challenges involved. Technically, the only aspect I sometimes struggle with – especially early in the morning – is calculating the appropriate exposure when using a lot of ND filters in dim light. Apart from that, I just need a sturdy ground to place the tripod, an unobstructed view of the sea, and it should not be too windy or too rainy. Obviously, the long exposures take a lot of time – enough to set up another camera and compose and expose some more. Sometimes I have three cameras at work. But most often I just enjoy being there. 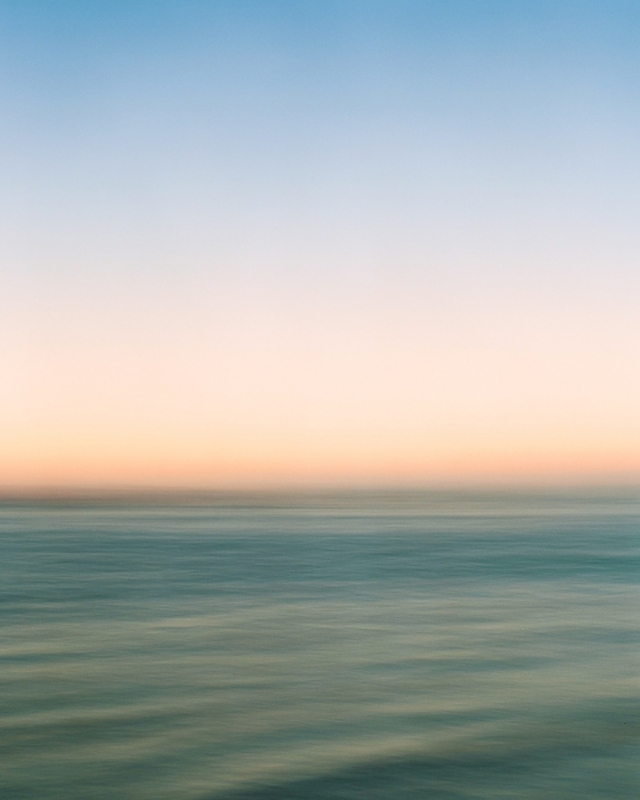 The approach to the seascape is always a bit abstract. No matter whether these are long exposures in a normal camera, or a pinhole, intentional camera movements – you never know how the finished photo will look before it is developed and scanned. That’s definitely some of the appeal to it. Q: Elsewhere in your photography, your lovely dogs are clearly a huge inspiration for you. Could you tell us a little more about your adventures together? We experience the smallest adventures, which become the biggest in the world. Every day, they teach me about being in the moment, and cherish the small things. Traveling with them is a joy – they love the camper van. Everything seems possible. Even two grown up humans and two medium sized dogs sleeping in a 4 foot wide pop-top bed. Honestly, words just fail to describe the pure joy and awesomeness they provide by just being around. That’s why I use a camera! Q: What is it that you love about shooting film? Where do I start? First of all, it is the look of film – I find it to have more painterly qualities and less of the very clear and clean look of digital…more of a mystery, less shiny and sparkly… And probably more elegant and polite, less obtrusive and invading. To me, film whispers, while digital states facts. To a degree this might be based on the technical characteristics of the emulsions, which seems to have a rounder shoulder when it comes to the highlights… Film does compress the dynamics, just like tape saturation, while dynamics in digital are pretty much linear. It just does not clip. Also, most colour negative emulsions are more forgiving to ‘too much’ exposure, so I do not have to worry about the 100% perfect exposure. Besides that, I am interested in the lucky accidents, like light leaks. Film is more open to experimentation without the need of a computer, like soaking film in some crazy soup before exposing it. Q: What is it that you love about working with UK Film Lab/Canadian Film Lab? First of all, the files I get are great from the technical perspective. But even more, they are lovely from my personal artist’s eye perspective! Due to the Pro service, excellent feedback, communication and discussion, I barely have to work on the files in post production – editing usually takes less than one or two minutes. So the files arrive in a state of “yay” and need very little to go “YAY”. Also, they helped me to find my vision in terms of choosing film stock and how to expose individual emulsions. On a personal level, they seem to such nice people – I like how they share knowledge and the little things in life. It is much more on a personal level than other labs – i see them more as people than a company. The news about moving to Canada came as a shock first, though. But as soon as the info was digested, it was clear I wanted to stay with them. The quality is right, they are real and nice people. Also, they are a good example of living the dream. Instead of playing safe, they decided to make a really big move at quite a risk. This is something I can relate to, which I dream about for myself, and which I wholeheartedly want to support. Q: What tips would you give to your fellow photographers for successful film shooting? Share insight and wisdom. Be open to new experiences. Learn all the technical stuff until it becomes second nature, and then forget it. Don’t overthink. Keep the flame of passion alive, the spark, the idea, the craziness. Do not to play by the book, make mistakes, go nuts, feel alive. Do what you love. Do it for you. This world is hard and more than crazy enough. Oh, and get a dog (or a cat, or donkey, or goat…) from a shelter.